NEW YORK -- Washington Capitals goaltender Semyon Varlamov, Phoenix Coyotes right wing Shane Doan and Detroit Red Wings defenseman Nicklas Lidstrom have been named the NHL's 'Three Stars' for the week ending Jan. 2. Varlamov stopped 55 of 56 shots in backstopping the Capitals to a pair of victories, including the 2011 Bridgestone NHL Winter Classic. He began the week stopping 25 shots for his second shutout of the season in a 3-0 victory over the Montreal Canadiens Dec. 28. 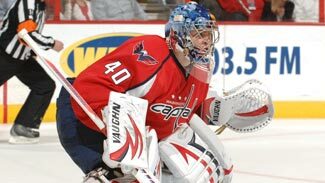 Named the Capitals' starting goaltender for NHL Winter Classic earlier in the day, Varlamov recorded 32 saves in Washington's 3-1 victory over the Pittsburgh Penguins in front of 68,111 outdoors at Heinz Field Saturday night. The 22-year-old Samara, Russia native improved his career regular-season record to 26-8-8 in 45 appearances. Doan led all scorers last week with eight points (five goals, three assists) in four games, extending his consecutive-game point streak to six. Doan scored the Coyotes' lone goal in a 3-1 loss to the Anaheim Ducks Dec. 28 and notched three points (two goals, one assist) in a 6-3 victory over the Los Angeles Kings Dec. 29. He tallied two more goals, including the 700th point of his NHL career, in a 4-3 loss to the St. Louis Blues Dec. 31. His first goal, at 6:20 of the third period, ended Blues goaltender Jaroslav Halak's shutout streak at 129:29. Doan finished the week by recording two assists in a 6-5 overtime loss to the Minnesota Wild Jan. 2. The Coyotes captain, still in quest of his first career hat trick, upped his career goals total to 285, including 37 two-goal games. The only player with more career tallies without a three-goal game is Hall of Fame defenseman Larry Murphy (287). Lidstrom tallied eight points (two goals, six assists) and extended his point streak to seven games as the Red Wings posted a 2-1-1 record. Lidstrom recorded a goal and three assists in a 4-3 overtime victory over the Colorado Avalanche Dec. 27, notched one goal and one assist in a 7-3 win over the Dallas Stars Dec. 29, tallied one assist in 4-3 overtime loss to the New York Islanders Dec. 31 and had one assist in a 3-2 loss to the Philadelphia Flyers Jan. 2. The 40-year-old Red Wings captain and six-time Norris Trophy winner ranks second among NHL defensemen in scoring with 37 points (11 goals, 26 assists) in 39 games.